We continue to review the latest science behind various neuro-chemicals, and continue to update this article as needed. The most recent studies in this area re-confirms my Fibromyalgia Protocol; the recommendations on the Mind Body Connection page (including links to sub-pages) and the Fibromyalgia Protocol pages are all solidly supported by today’s science. Years ago, when I learned that chemical messengers controlled 80% of our body functions, I felt they would be very relevant to any treatment for fibromyalgia. Over the past few years, the focus of studies in this area have provided a growing cascade of results to help us select elements of an integrated plan for a treatment for fibromyalgia. I like to keep up (and keep you up to date) and these ongoing articles will provide new data, a new slant in one area, and clear up a couple of internet myths about serotonin... drugs taken to increase serotonin can be dangerous, and although 5-HTP is a more natural way to raise serotonin levels, it is not for everyone and can cause cortisol levels to rise in some people, causing adrenal stress. Melatonin supplements are also not appropriate for everyone and especially those of us with auto immune illness need to take precaution. For instance, if you wake up three to four hours after taking oral melatonin, it might not be right for you, or you may need a lower dose. Yes, there are manufacturers and doctors who are prescribing too high of a dose, interrupting the natural process within the body. Don't be too eager to alter hormones, instead consider the following suggestions to raise these necessary messengers safely and naturally. Also, I recommend taking a quality tart cherry extract (a natural form of melatonin) if you find that taking oral melatonin is waking you up after a few hours. Or try taking melatonin spray which will bypass the liver and can be more effective as well. The most effective form and cost effective as it will last a very long time. I have personally used the spray form because I did not tolerate oral melatonin. 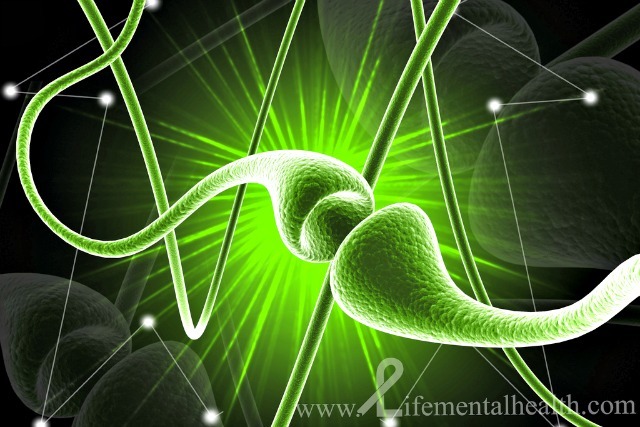 What’s The Role Of Serotonin In The Body? Serotonin has several roles within our body. 90% of our serotonin is synthesized in our gut from tryptophan, an essential amino acid that is a precursor to serotonin; the remaining 10% is found in our Central Nervous System (CNS) similarly synthesized from tryptophan. An essential amino acid means that our body must have it to live; our body doesn’t provide it; and therefore, we must get it through our diet or supplementation. In case you’re wondering why the CNS has to synthesize its own serotonin rather than using the serotonin generated in the gut, serotonin cannot penetrate the blood-brain barrier, but certain forms of tryptophan can. In our gut, serotonin causes the gut to move food along. After that job is completed, it finds its way through the gut wall and is absorbed and stored by platelets in the blood. Whenever there’s an injury to the body, the platelets rush to the site of the wound and cause clotting. At the same time, they release the serotonin which acts as a vascular constrictor thereby slowing the loss of blood. Pretty neat! Wait until you hear about the serotonin in our CNS! 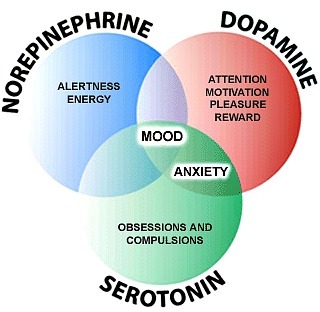 In our brain (CNS) tryptophan is synthesized into serotonin and is a major contributor to our feelings of well-being and happiness or what many of the scientific studies call “mood”. In fact quite a few studies confirm a direct correlation between the level of free serotonin in our blood and our mood changes as well as our social behavior. Higher levels of serotonin correspond to “agreeableness” in individuals as well as a positive outlook; both necessary in any treatment for fibromyalgia. Serotonin affects most of our brain cells. This is not surprising... because serotonin possibly more than any other neurochemical affects most of our brain cells either directly or indirectly. It directly affects our mood, appetite, sleep, social behavior, body temperature regulation, memory, ability to learn, and sexual desire. Outside the brain, it’s involved with our heart, muscles, digestive and endocrine systems. Please also be aware that 5-HTP should not be taken with dextromethorphan (in Robitussin DM and others for example) as too much serotonin in the brain can cause heart problems and more anxiety. This is why it is a critical piece of any protocol for a treatment for fibromyalgia. There have been equally important findings, beyond the effect of serotonin on mood, that it may be a predictor of good or poor physical health. Low levels of serotonin lead to “hostility” while higher levels lead to “agreeableness”. In 45 separate studies hostility was associated with both the development of Chronic Heart Disease (CHD) and poor survival, while “agreeableness” was shown to be a significant protective factor against mortality. The bottom line is that a positive mood within the normal range (not manic) is an important predictor of health and longevity. In an important, long term study of a group with a mean age of 22-years, those ranked in the lowest 25% for positive emotions died on average 10-years earlier than those ranked in the top 25%. And, in a series of recent studies negative emotions were associated with increased disability due to mental or physical disorders, increased depression, increased suicide and increased mortality. Positive emotions protected against these outcomes. These studies just emphasize the role of serotonin in the treatment for fibromyalgia. So, research confirms that positive emotions and agreeableness foster congenial relationships with others. This in turn will create the conditions for an increase in social support from family and friends. This is of course is a particularly important need of the fibro community and a key piece of any treatment for fibromyalgia. How Can We Raise Our Serotonin Level? 1) The first but least effective way is with diet. Of course since serotonin is synthesized from the amino acid tryptophan which we must get from diet, all serotonin comes from what we eat – indirectly. But the question is can we raise its level via food? There are internet myths about eating a high protein meal (turkey is usually quoted) which has high levels of tryptophan to increase serotonin level; or eating bananas or walnuts which are higher in tryptophan. Here’s the problem. First of all, if you look at a long list of tryptophan containing foods, it’s in many foods; and the differences in the amount of tryptophan between them is not great. Secondly, tryptophan is a member of a group of 13 amino acids of which 12 (not tryptophan) are found in our muscles. When we eat that high protein, high tryptophan meal.. our bloodstream is flooded with all 13 of those amino acids, all trying at the same time to get through the blood-brain barrier into our brain. Poor little tryptophan has little chance to compete and our serotonin level actually decreases. If, however, you eat a high carbohydrate meal, insulin is produced, the 12 amino acids other than tryptophan are swept from the bloodstream and returned to the muscles, and tryptophan has a clear path through the blood-brain barrier to the brain. The problems with this approach are twofold. First, using this method often will lead to unwanted weight gain. Secondly, is the danger of insulin sensitivity or Type 2 diabetes? 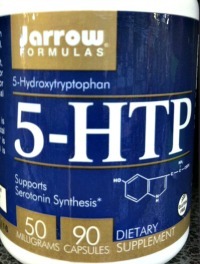 If you suspect your serotonin level is low (depressed, moody, sleep issues), you might consider a dietary supplement such as 5-HTP which provides tryptophan, the serotonin precursor. However, as I stated above, this does not work for everyone and can have the opposite effect in sensitive people. 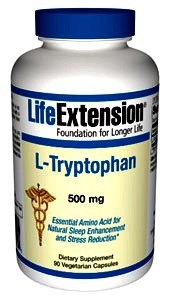 Check with your doctor or naturopath on dosing for L-tryptophan. Also, on my Nutrition Tips page, you’ll get some ideas how to avoid the insulin dangers of heavy carbohydrate meals, while providing enough carbs to allow tryptophan to reach the brain unimpeded. This will help you get efficient uptake of your 5-HTP or L-Tryptophan supplement in your treatment for fibromyalgia. Fortunately, the remaining three methods of increasing our serotonin are Sure-Fire and fit well into my treatment for fibromyalgia protocol. 2) This is not new but many studies confirm that we can intentionally intervene in our thought processes to improve our attitude (mood). There is a branch of psychology dealing with Cognitive Behavior Modification which is what I talk about on the Attitude Conditioning page. It’s really about continuing and consistent practice of positive thinking. Remember how often I say, “A smile from the heart is a great place to start”. Once, you develop a habit of attitude conditioning, your brain will develop new neural pathways that reinforce this practice, and it WILL become second nature. This is a major step in your treatment for fibromyalgia. It's not hard if you are determined! Now here’s the better news.... Studies have confirmed that when you do this, the level of serotonin rises. When serotonin rises, your mood improves. When your mood improves, serotonin rises again, and so on. In other words, there’s a positive feedback loop that once kicked off, tends to reinforce itself. I cannot overemphasize the importance of this technique in your treatment for fibromyalgia. It brought me out of many bad mental states and depressions. It kept my marriage together. It is the single biggest factor that kept me going as I worked my way back from those dark days I wrote about on the home page. And still, every morning, my first thought is picturing my heart smiling before I open my eyes. 3) Next is an approach that lets you kill three birds with one stone – Bright Light. Yes bright light increases serotonin. It also can be used to reset your body clock to support sleep. And, if that bright light is sunshine, it provides Vitamin D as I talked about recently on the "Treatment for Fibromyalgia With Vitamin D" page. The bright light needs to be sunshine. On the most overcast day the amount of sunlight measures 1000 lux or more (lux is just a unit of measure of light); a sunny day measures 3000 lux; while inside any home the light is well below 1000 lux. There are “light boxes” available, but they are very restrictive and probably not a good choice except in special cases (bedridden). And, they don’t solve the Vitamin D issue. We should not be surprised that depression is so rampant in the developed countries. Until roughly 150-years ago (or less), we were an agricultural society, and before that, hunter-gatherers. Over thousands of years, our bodies became “wired” to the day-night cycle. Out in the sun all day, when night came we ate and went to sleep. No “late night talk shows” to watch on TV ‘til midnight. This why I recommend going to bed early, getting up early and out in the sun for at least 20-minutes with no sunscreen. If needed, use your DVR to record those late night TV shows and watch them at a time that supports your body clock. That keeps our body clock in tune with our natural “wiring”. And, now, studies have shown that our serotonin level rises from that time in bright light. A recent study found that the average working person was exposed to light levels greater than 1000-lux for only 30-minutes in winter and 90-minutes in summer. Not enough, “you need your light exposure"
One additional note before moving on, as you are resetting your body clock and raising your serotonin level thru sunshine, in your brain some of that serotonin is being synthesized by the pineal gland into melatonin, the body’s natural sleep aid. 4) Yes, the fourth method is exercise. As a trainer (with fibromyalgia) specializing in fibromyalgia, I believe that exercise will always be a necessary treatment for fibromyalgia; and studies continue to show that exercise is one proven way to improve our fibromyalgia symptoms. It has to be part of our treatment for fibromyalgia. Staying strong and agile is essential to the fibro body. Studies have found that clinical depression can be improved by exercise because it raises brain serotonin levels. In fact it’s so reliable that for those of you in the UK, your National-Institute-for-Health-and-Clinical-Excellence has published a guide on the treatment of depression. The guide recommends exercise rather than antidepressants in many cases (mild to moderate depression). It’s now been confirmed that an exercise session of only 40-minutes can have an immediate benefit on mood. The most consistent results occur when you are undertaking aerobic exercise. Within a period of time, the improved mood from serotonin will be joined by endorphins, the body’s own pain reliever. Like serotonin, endorphins are also triggered by exercise. If I could wave my magic wand to allow you to experience what exercise is like for a fibro sufferer after just a few months, you’d start exercising today! It’s empowering! It makes you smile. And, it gives you more good days than bad. Just start slow; increase either reps, duration, or pace every week just a little; make a "big deal" out of even small improvements; and most of all, be consistent. The endorphins will come in time with greater conditioning.